The second chunk of photos (56!) from our trip to Germany starts here. This batch begins on Monday at midday on the Autobahn; after having rendezvoused with Karla and our luggage (and converted to lighter clothing, hooray for shorts! 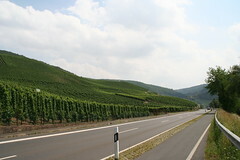 ), we set out south toward the Mosel for a series of wine tastings: Dr. Loosen in Bernkastel, Clüsserath-Weiler in Trittenheim, St. Urbans-hof in Leiwen. If you happen to be looking at the map, this batch covers items one through five on the itinerary, plus an intermediate stop in Piesport to take in the view, concluding with our arrival in the village of Mehring. There's some pretty good stuff in here (if I do say so myself), including a few of what I'd consider to be the stand-out images of the trip. I'll probably be posting the next batch over the weekend, so stay tuned! Music: Coldplay - "A Rush Of Blood To The Head"